Notre Dame breezed through its first four games of the season, piling up 140 total points while only giving up 46. 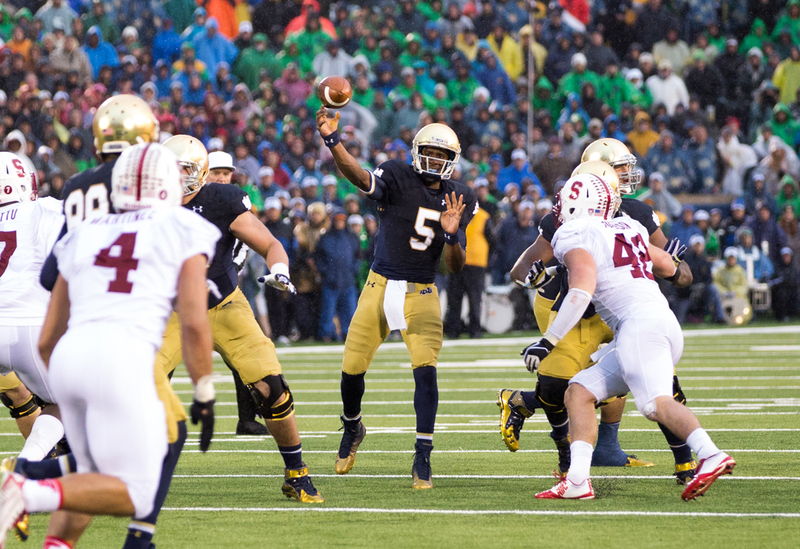 Against Stanford, the Irish faced the first threat to their undefeated record, stacking up against the nation’s top-ranked defense. Until they posted the go-ahead score with just 61 seconds left on the clock, extending that streak to 5-0 seemed further from reality than it had at any point before. Next weekend, Notre Dame will take on current No. 1 Florida State and reigning Heisman Trophy winner Jameis Winston. The Seminoles have looked shaky at times, but they will definitely present the biggest challenge to Notre Dame’s season so far. Last Saturday was a dogfight for the Irish. Next Saturday looks like it should play out in a similar way. With that in mind, it’s important that Notre Dame doesn’t forget about this Saturday. This week’s matchup with North Carolina should figure to go the same as the first four games, with the Notre Dame offense rolling and the defense carrying on its stellar season. While the Irish matched up with Stanford’s No. 1 scoring defense last week and posted a season-low 17 points, they should have no problem scoring on the Tar Heels, who bring the 121st-ranked scoring defense out of 125 FBS teams to Notre Dame Stadium. Notre Dame’s offense scores 31.4 points per game. North Carolina’s defense surrenders 42.0 points on average. The Irish should have no problem getting on the board and doing so often. On the other side of the ball, the Tar Heel offense averages 34.0 points per game, but it has also faced three non-Power 5 teams in its five games, including Liberty, against which it posted 56 points. It will have to get through Notre Dame and its third-ranked scoring defense, which cedes less than two touchdowns per game. The numbers are undoubtedly in Notre Dame’s favor. But if the Irish look too far ahead to their matchup with the Seminoles, they may get caught in a notorious trap game, which could be a fatal blow to their playoff hopes. In the last two seasons, Notre Dame has struggled in games that should have been blowouts, against Pittsburgh in triple overtime in 2012 and Navy last season. It can’t afford to have that happen again this year, especially since the home team is a 17-point favorite. Irish fans complained when Notre Dame was jumped in the AP poll this week by Ole Miss and Mississippi State — both of which are now tied for the No. 3 spot — after the Rebels and Bulldogs pulled off upsets over then-top-six teams. If the now-No. 6 Irish drive through their schedule in the same way they have been playing and win out, they’ll leap back ahead and take a top spot. Eventually, the SEC West — which includes Mississippi, Mississippi State, No. 2 Auburn, No. 7 Alabama and No. 14 Texas A&M, the latter two of which already have one loss — will have to decide one winner, and that winner will face off with the SEC East champion for the SEC crown. Notre Dame will play Florida State next Saturday, so if it beats the Seminoles, it will knock another team out of its way to the college football playoff. Two other undefeated teams — No. 5 Baylor and No. 9 TCU — face off this Saturday, so only one of those two will still be perfect on Sunday. If the Irish keep their own perfect season intact, only two potential teams may remain undefeated as well — the SEC champion and the Baylor-TCU winner. With four spots open in the playoff, the Irish would be guaranteed a chance to compete for the national championship. They just have to focus on North Carolina this week and not look too far ahead to the future, no matter how safe or tempting it may seem to do that.